Magnetic earrings do not necessitate that you have your ears pierced. Often compared to plugs, they fit snuggly but comfortably on the ear lobe and the strong magnetic lock secures them. Most models are made of surgical steel, are sold individually and are all in stock. These types of earrings obviously use magnets to hold them in place, so no need to get your ears pierced. The magnets are designed to be strong enough to lock the earring in place but not to strong as to become uncomfortable. Magnetic earrings look very much like they could be stud earrings because the magnets are tucked away inside the earring. They are also incredibly practical and easy to remove at your convenience. All of our magnetic earrings are tested nickel-free, as per the EU legislation standards. This means that they must release less than 0.5 micrograms of nickel per cm2 per week. For those sensitive to nickel, may we suggest our earrings made in wood or in sterling silver. 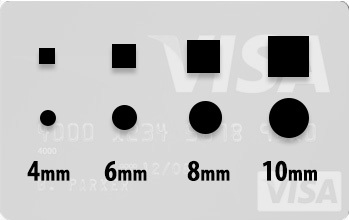 You can get a good idea of the different sizes we offer if you look below and see each size compared to a credit card.